Audi has introduced their newest version of their top-of-the-line sports car. 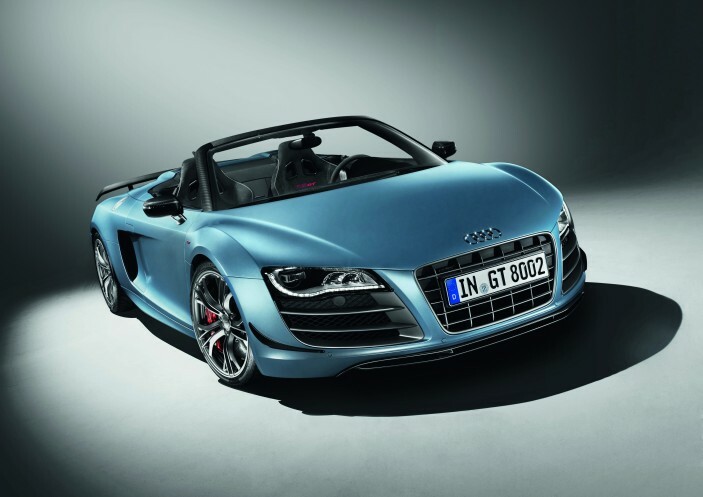 The R8 GT Spyder and its hard-top sibling are the most powerful R8 ever produced, it’s also the most expensive. With a base MSRP of $213,800 (inlcudes $1,200 destination fee and $2,100 gas-guzzler tax) the special-edition drop-top costs $38,650 more than the regular 5.2-liter Spyder. But what do you get for an additional 38 grand? Well, just as with the R8 GT Coupe the Spyder will be limited to only 333 units worldwide, with 50 coming to the U.S. Beside the exclusivity you get an upgraded 5.2-liter naturally-aspirated V10 that ups the peak horsepower from 525 to 560. The added power is transferred to the road via Audi quattro all-wheel drive and a six-speed R Tronic sequential gearbox. More horsepower is always a good thing, but it’s useless if their is too much weight. To improve the power to weight ratio engineers have eliminated over 187 lbs with an engine frame made from lightweight magnesium along with carbon fiber-reinforced polymer and carbon fiber composite used heavily throughout the vehicle. On the road the Spyder will be more agile and nimble due to a sport suspension with stiffened calibration. This tweak also lowers the GT Spyder by 10 millimeters. 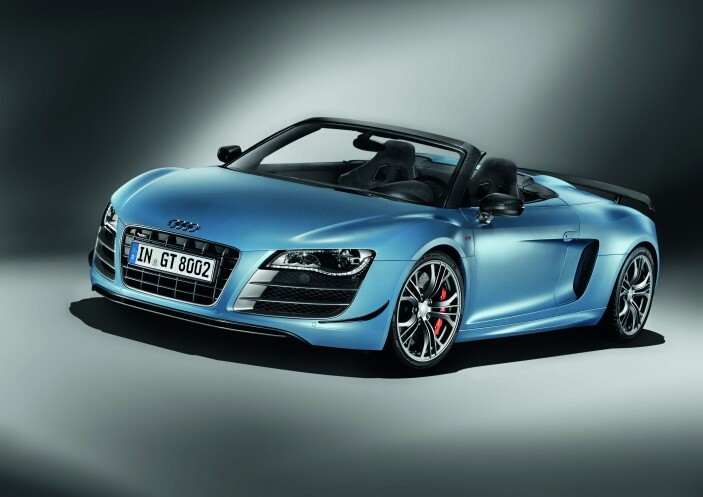 The first deliveries of the Audi R8 GT Spyder are scheduled to take place this month. If you’re in the market for this four-ringed beauty you better hurry as only 50 units will come to our shores. When you think of Vail, Colorado certain activities come to mind, namely skiing, snowboarding, and pretty much anything having to do with snow or the outdoors. 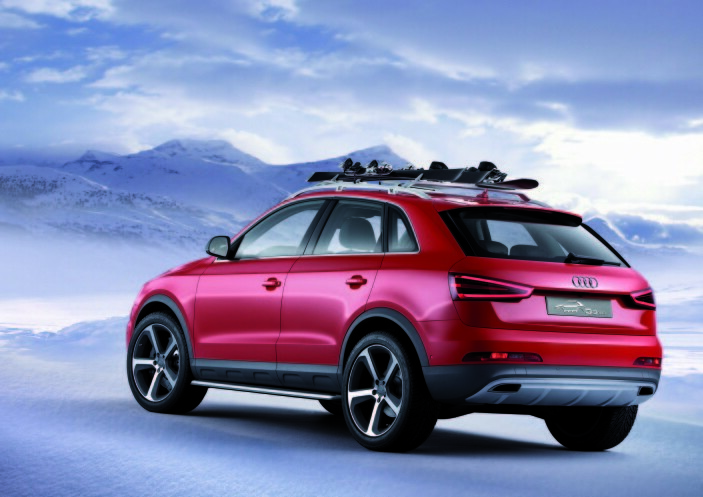 Just like its name, the new Audi Q3 Vail Concept is aimed at interesting customers who enjoy the same activities for which the town has become famous for. The exterior is painted in vehicle-specific Energy Red and has golden pearlescent particles within the clearcoat. Other eye-catching, esthetic pieces on the Q3 Vail’s exterior include matt gray quartz-based paint along the running boards, while a high-gloss package surrounds the windows with aluminum and high-gloss black. On top of the colorful accents the special Q3 has unique stylistic elements that differentiate it from its more common counterpart. Flared wheel arches and running boards add a more aggressive look to the body lines and the roof line has added aluminum roof racks capable of carrying your skis and snowboarding to whatever winter resort you wish. 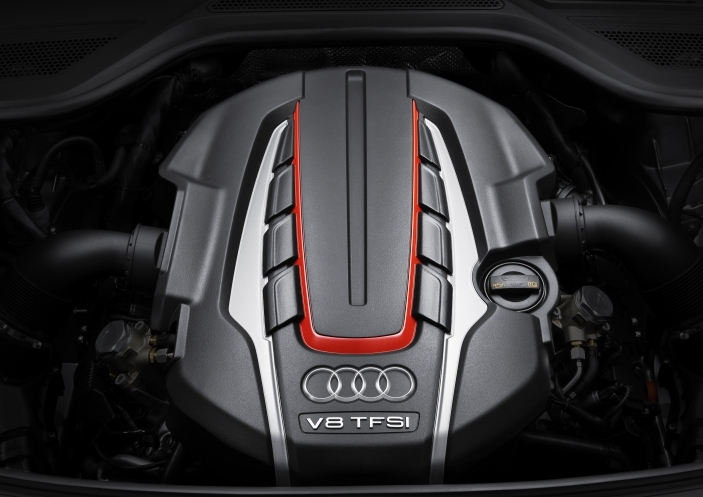 Helping you get to your destination is the Q3 Vail’s power plant, the same engine that powers the ultra, high-performance Audi TT-RS. The 2.5-liter turbocharged five-cylinder has been tuned down from the 360 hp and 343 lb-ft of torque found in the TT-RS to a slightly more manageable 314 hp and 295 lb-ft of torque for the special Q3. All 314 hp is transferred to all four wheels via Audi’s quattro permanent all-wheel drive system and a seven-speed S Tronic transmission. Under the hood the Q3 Vail resembles the rest of the vehicle with a number of special colors, and accents to distinguish it. The cylinder head covering the five cylinders is painted in a red, wrinkled-paint design. Rounding out the specialties in the engine compartment include a partial carbon-fiber-reinforced polymer (CFRP) engine cover, decorative plastic trim around the engine compartment and the acoustic mat embroidered with “Q3 Vail” in gray stitching. 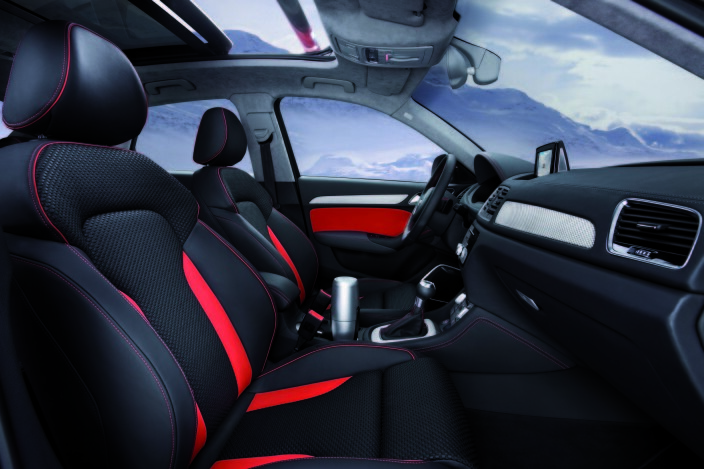 Like the rest of the vehicle, the interior of the Q3 Vail continues the trend of special colors, namely red, gray and black, along with activity-orientated features, trim pieces and leather upholstery. The trunk of the Q3 Vail has a built-in charging station capable of powering up flashlights, iPods and other electronic devices. 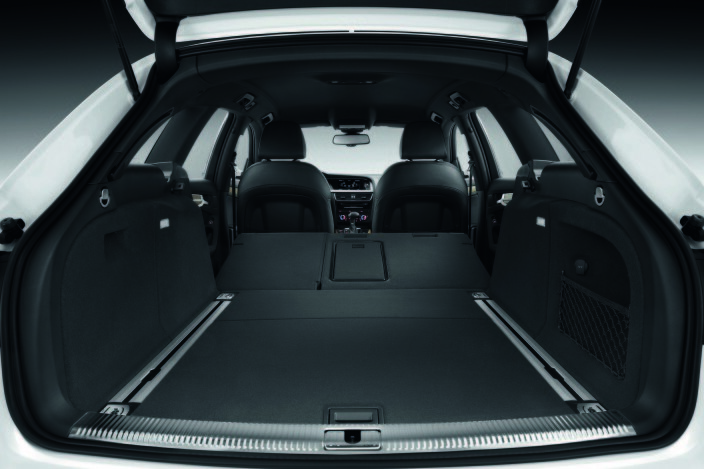 Another feature in the trunk is integrated heat seating cushions which has been incorporated into the trunk floor mat. A third feature in the interior of the Q3 Vail is a custom Thermos bottle with built-in LCDs that tell you how much battery juice is left. The Thermos is located in the center console cup holder and is able to heat or cool a drink. Although the Q3 Vail is a concept vehicle, Audi has confirmed that the U.S. will begin to see a U.S spec Q3 beginning in late 2013. 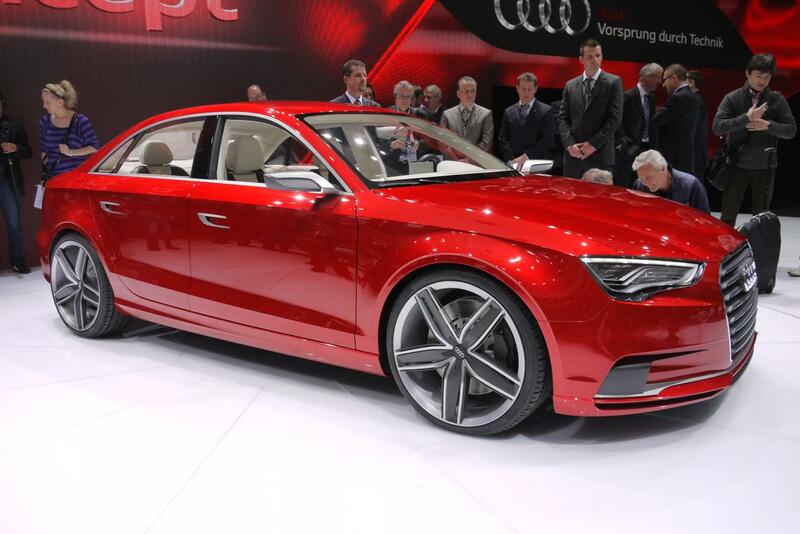 Three models from Audi’s high-performance S-line, the S6, S7 and S8 will debut at the 2011 Frankfurt Auto Show. All three vehicles will be powered by versions of Audi’s new 4.0-liter, twin-turbocharged V8. According to Audi the new engine offers greater performance while reducing emissions and improving fuel economy. Despite being substantially smaller than the outgoing 5.2-liter, naturally-aspirated V10, the new engine in the 2012 S6 and S6 Avant (wagon) pushes out nearly identical horsepower and torque numbers. Peak output has been reduced by 15 hp to 420 hp, but torque has increased by just over 7 lb-ft to 405.6 lb-ft from 1,400 to 5,300 rpm. Even with the significant reduction in displacement and slight drop in horsepower, the new engine still delivers performance figures consistent with Audi’s S models. 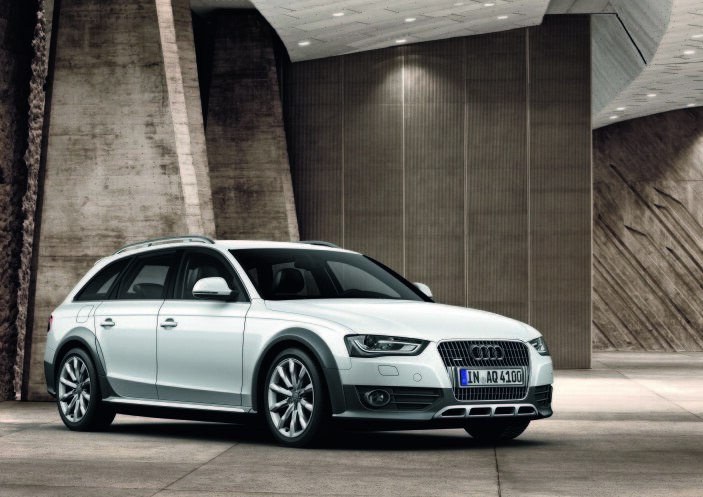 The S6 reaches 60 mph in 4.8 seconds and the S6 Avant just 0.1 slower in 4.9 seconds. All power for the S6 is transferred to the wheels via the seven-speed S tronic transmission and offers Quattro all-wheel drive. While performance is impressive what really shines through is the S6′ efficiency. Audi claims overall fuel economy has improved by as much as 25 percent to roughly 24 mpg. Much of the added mileage is the result of high-tech technologies, namely in the form of start-stop, energy recovery and cylinder management systems. The S6 has also incorporated an active Noise Cancellation system (ANC), which reduces and cancels out much of the noise emitted from the engine during cylinder disengagement. Stylistically the S6 differs from the A6 courtesy of exterior mirrors in an aluminum-look finish, prominent side sills and a single-frame front grill. It can also be distinguished by two exclusive exterior paint colors, Estoril Blue, crystal effect and Prism Silver, crystal effect. 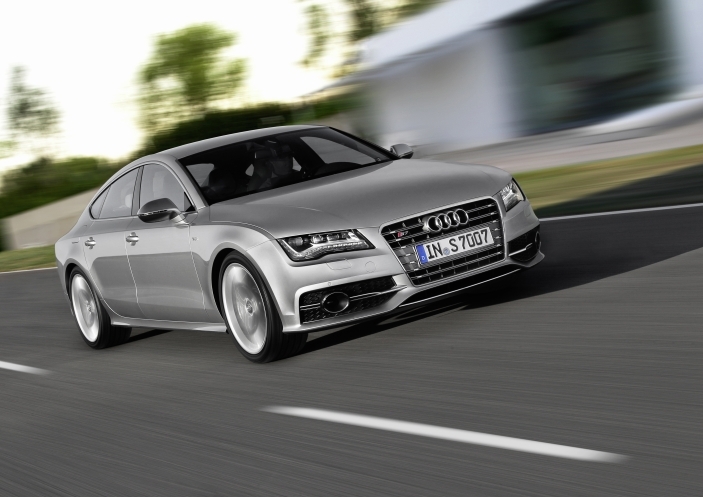 The S7 offers the same engine, with the same horsepower and torque numbers as the S6 and S6 Avant. Technology and other features are identical between the two models. The S7 comes standard with an adaptive air sport suspension, 19-inch wheels, and internally ventilated disc brakes front and rear. 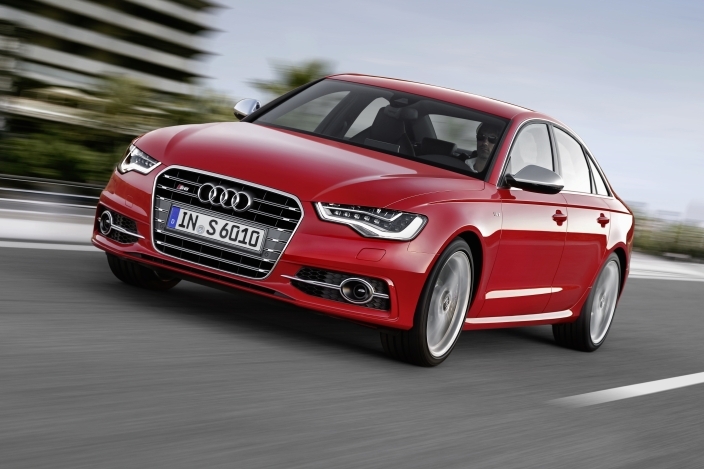 The top-of-the-line S8 once again sets the standard for Audi’s S-line. 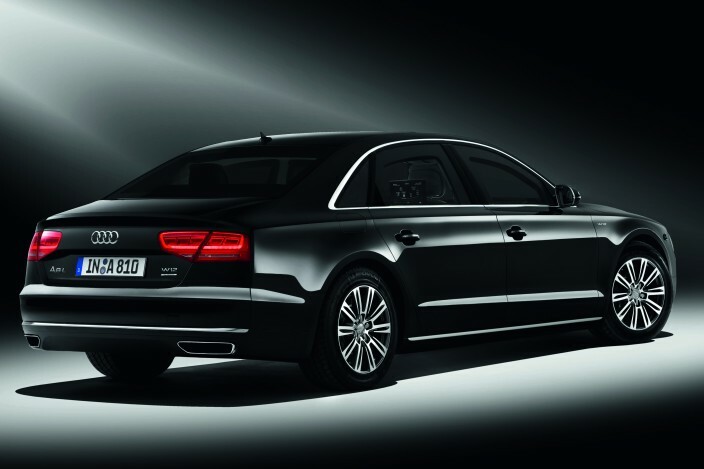 With a more robust V8 engine the S8 sprints from 0-60 mph in just 4.2 seconds with a limited top speed of 155 mph. As with the S6 and S7, the S8 has increased performance while drastically improving fuel economy. Average consumption has jumped from 17.8 mpg to 23 mpg, regardless of a 70 hp improvement in power. Cylinder management, Active Noise Cancellation among other technology are all standard on the S8. All other aspects to the S8, from the near-exclusive use of aluminum in the body design, to the high-end finish in the interior all reflect why this is Audi’s flagship model. There is a reason most high-performance vehicles are conceptualized as a coupe before a convertible. Not to mention that owners often opt for the hard top rather than a soft top. Convertibles usually cost more to produce, to purchase and are also inherently heavier. This added weight results in a loss of performance. Not something most want to hear after dropping over six figures on a vehicle. However, the Audi R8 GT Spyder has managed to turn the above notion on its head. Not only has the supercar refused to add any weight, it has gone on a strict diet of carbon fiber, ultra-light magnesium and aluminum.The R8 GT Sypder is literally covered in carbon fiber-reinforced polymer (CFRP). The cover over the soft-top compartment, large rear side panels use CFRP, as well as the fixed rear spoiler and the redesigned front spoiler and rear bumper. Body panels are not the only pieces of the vehicle that have received special treatment. The interior seats, composed of glass fiber-reinforced polymer save a remarkable 69.45 lbs. The result of all this ultra lightweight technology is a total weight of just 3,615.58 lbs. That’s 187.39 lbs less than the regular R8 Sypder 5.2 FSI quattro. The R8 GT Sypder shares the same 5.2-liter V10 as the R8 GT coupe. 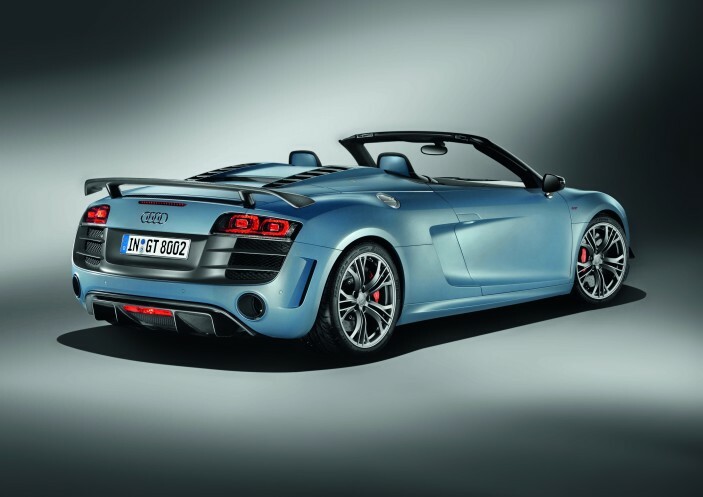 It produces 560 hp and 398.28 lb-ft of torque at 6,500 rpm, allowing the R8 GT Spyder to accelerate from 0 to 100 km/h (62.14 mph) in 3.8 seconds and reach a top speed in excess of 196 mph. All of this horsepower and torque is transferred to the wheels via a standard automated six-speed R tronic transmission with two fully automatic modes and an additional manual mode. The R tronic transmission also gives the driver the option of using launch control for blistering acceleration from a stop, with gear shifts taking only one-tenth of a second. 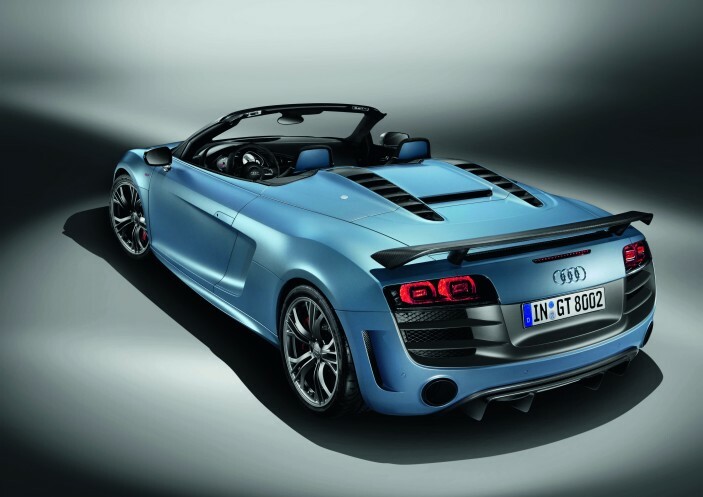 As with all models of the R8, the R8 GT Spyder features Audi quattro all-wheel drive. So yes, you can rip around corners and through the twisties with added ease. On top of the all-wheel drive system the driver can have the added security of knowing there is an upgraded aluminum double wishbone suspension and lightweight carbon-fiber ceramic brakes. That being said, if you really want to let loose you just put the Spyder into sport mode, effectively deactivating the ESP stabilization program. As with the GT coupe, the R8 GT Spyder will be limited to 333 units worldwide, with no more than 90 making their way to U.S. shores. If you want one you better act fast and have deep pockets. All 333 examples of the GT coupes sold out long before they were even built and you can expect the same to be true for the Spyder. Pricing for U.S. spec car has not be released yet. However, judging by the German base MSRP of 207,800 euros, you can expect the U.S version to cost in the area of $304,000. Audi has unveiled its Q3 compact SUV in anticipation of next week’s Shanghai auto show. This is Audi’s first time venturing into the premium compact SUV market, with the Q3 being in direct competition with the BMW X3 and Mercedes-Benz GLK350. The Q3 is offered with four different engine choices. All four engine are turbocharged four-cylinders and feature direct injection, energy recovery system and start-stop system. The basic power plant for the Q3 is a front-wheel drive 2.0-liter TDI, producing 140 hp. This particular engine also gets remarkable fuel economy, 45.2 mpg. The second engine option is also a 2.0-liter TFSI quattro that produces 170 hp. The first and second engine options are mated to a six-speed manual transmission, while the other two power plants, producing 177 hp and 211 hp respectively, feature quattro all-wheel drive and are mated to Audi’s seven-speed S Tronic transmission, allowing the driver to choose from four different driving modes. Another aspect to the Q3 that contributes to its overall efficiency is its lightweight design. The engine hood and wraparound tailgate are made of aluminum, resulting in the basic version of the Q3 weighing in at only 3,307 lbs. The passenger compartment is composed of ultra high-strength steel and the vehicle’s low drag ratio of 0.32 adds to the Q3′s excellent fuel economy. With interior and technological options that are available on the Q3, the sky’s the limit. 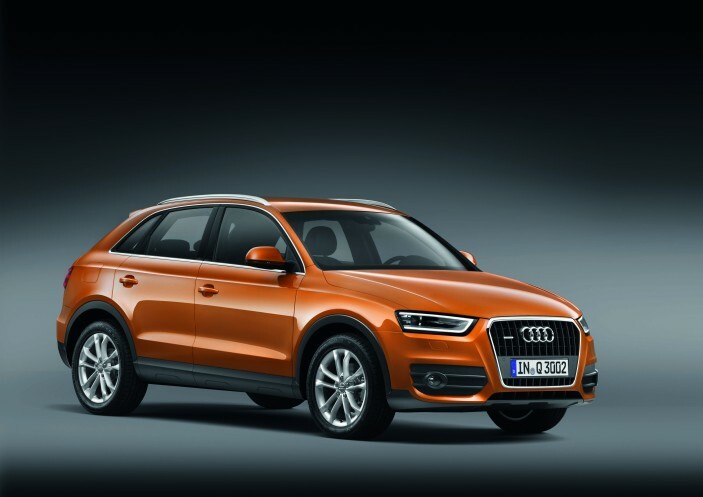 Audi is offering the Q3 is a choice of 12 exterior paint colors with five customized combinations with add-on parts. These add-on options include the standard black add-on parts, or if the customer chooses, add-on parts with full paint finish or color-contrasting anthracite gray. Standard technological features include but are not limited to, an on-board computer, ambient lighting package, panoramic glass roof, storage package, sports seats, electrically adjustable and heated seats, two-zone deluxe automatic air conditioning, tinted rear windows, and a three-spoke leather steering wheel. When a car company decides to make a limited edition of one of their highest priced and most expensive models many people question whether or not the special edition vehicle is worth the extra money. This is especially prevalent when the particular model to be improved upon is a high performance one. On Wednesday Audi unveiled plans to produced a limited edition of their signature model, the Audi R8. The limited edition Audi R8 GT will be restricted to only 333 units worldwide, with just 90 of those cars destined for the U.S. market. The R8 GT benefits from extensive use of carbon fiber throughout the vehicle, with particular attention focused on the rear hatch, spoiler and diffuser. This additional carbon fiber results in the R8 GT weighing 180 lbs less than a regular Audi R8 5.2 coupe. The heart of the R8 GT is a modified 5.2-liter V10 engine producing 560 hp, 35 more than the Audi R8 and R8 Spyder. This added horsepower allows the R8 GT to accelerate from 0-60 mph in 3.6 seconds, one tenth quicker than the R8 coupe, and reach a top speed of 199 mph. All of this horsepower is transferred to all four wheels via the Audi R tronic sequential manual transmission and Audi quattro all-wheel drive. The R8 GT also features unique changes to both the exterior and interior of the vehicle. The exterior of the R8 GT features matte finishes on the sideblade and grill, and is also offered in a special paint color, Samoa Orange. The calipers on the optional carbon-fiber reinforced ceramic brakes feature a red anodized finish. The interior of the R8 GT boasts a numbered gear shift knob, and the instrument cluster painted white with the R8 GT logo. Other unique interior pieces include the seats, handbrake lever headliner and steering wheel finished in black Alcantara with contrast stitching. Of course, all of these special features come at a price, and a high one at that. 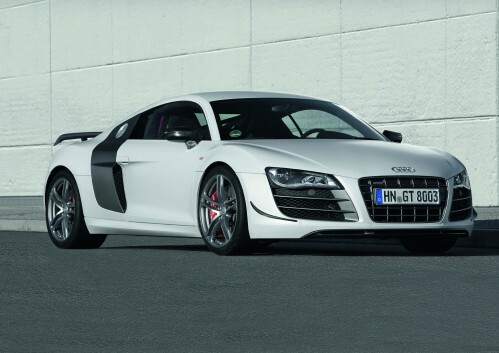 The Audi R8 GT has a starting MSRP of $198,050. That’s $49,050 more than the R8 5.2 coupe. If you want to get your hands on this limited edition R8 you better act quickly, very quickly. Just 333 units of the R8 GT will be produced worldwide, 90 of which will be imported to the U.S.
Audi has unveiled the Q5 hybrid quattro, making Audi the latest competitor in the hybrid SUV market. The Q5 will compete with Porsche’s Cayenne S Hybrid and BMW’s ActiveHybrid X6. Audi’s Q5 hybrid quattro will have significantly less horsepower and torque than either the Porsche or BMW variants. The Q5 hybrid quattro is powered by a 2.0-liter TFSI gasoline engine and an electric motor. The two power plants together creates 245 horsepower and 354 lb-ft of torque. This allows the Q5 hybrid quattro to get an estimated 33 mpg. In comparison, the BMW ActiveHybrid X6 is powered by a 4.4-liter twin-turbocharged V8 engine, producing a whopping 400 HP between 5,500-6,400 rpm and 450 lb-ft of torque between 1,750-4,500 rpm. The added electric engine brings the total horsepower to 480. In terms of performance, the Porsche Cayenne S Hybrid falls in between the BMW and Audi. The Cayenne S Hybrid is powered by a 3.0-liter V6 engine, producing 333 HP. The electric motor produces 47 HP, bringing the total to 380. The Q5 hybrid quattro is the first hybrid SUV to be very dependent on electric power, in order to achieve a sporty vehicle that can have excellent fuel efficiency. The electric motor can drive up to speeds of 62 mph on electric-only power. The electric motor’s capabilities is made possible by a lithium-ion battery weighing only 83 lbs. The Q5 hybrid quattro is equipped with an 8-speed tiptronic transmission, which has been extensively modified to handle the power of both systems without the aid of a torque converter. 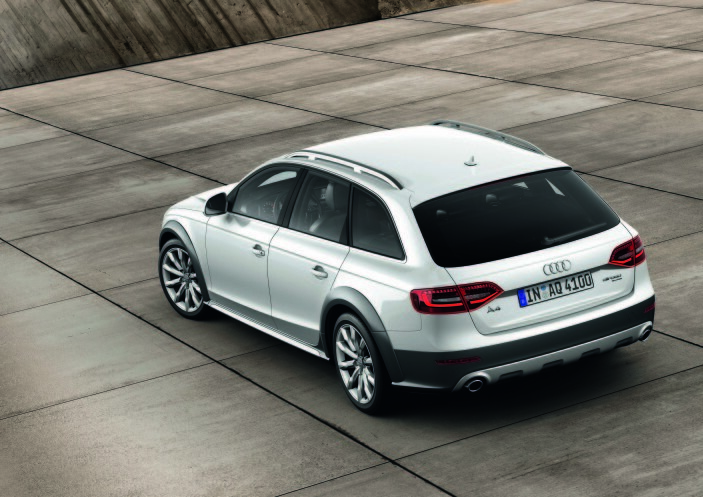 In addition to the tiptronic transmission, the Q5 hybrid quattro features five different driving modes. These modes are operated depending on the manner in which the driver is operating the vehicle. When the Q5 hybrid quattro is stopped at traffic light both the internal combustion and electric systems are deactivated. When the driver releases the brake pedal the vehicle beings to operate on electric power, which is available up to 62 mph. The driver can also select the driving mode they would like via a button on the center console or gear selector. The “EV” mode gives priority to the electrical system when in city conditions. The other two options includes “D” mode, which gives the vehicle it best fuel efficiency, and “S’ mode if the driver chooses to enjoy a sportier drive. Although the Q5 hybrid quattro is just that, a hybrid vehicle. It also retains it’s purpose and versatility as a SUV. 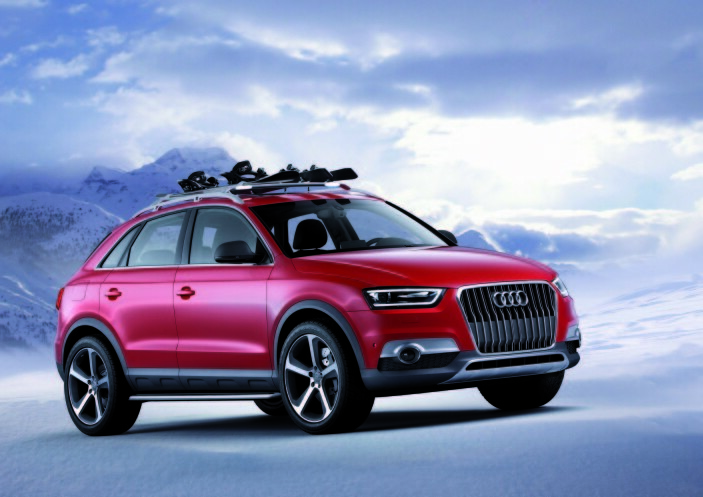 The Q5 hybrid quattro is capable of towing loads up to 4,409 lbs. The Q5’s body and chassis structure is also the lightest available on the world hybrid SUV market. It utilizes aluminum and hot-shaped steel on many areas of the body, providing the Q5 hybrid quattro with a body that’s both lightweight and very strong. The Q5 hybrid quattro is scheduled to make its first appearance in foreign showrooms in the late part of this year. Pricing hasn’t been released. However, based on the MSRP’s of the two 2.0-liter gasoline versions, the Q5 hybrid quattro should fall in low to mid $40,000 range. After initially making it’s world debut at the Geneva Auto Show in March 2010, the Audi TT RS was thought to only be destined for the European market, much like its larger and more powerful cousin, the Audi RS6. However, like most everything in life, things change. This allowed the TT RS to travel across the vast Atlantic ocean and be available to the U.S. market. This decision, which should only help boost Audi’s status in the United States, and has made enthusiasts of the “four rings” quite pleased. The TT RS made its first official debut in North America yesterday, Feb. 9, at the 2011 Chicago Auto Show. The TT RS will be the newest addition to a pair of two-seaters currently available to the U.S. market, those being the standard Audi TT and sportier and nimbler TTS. 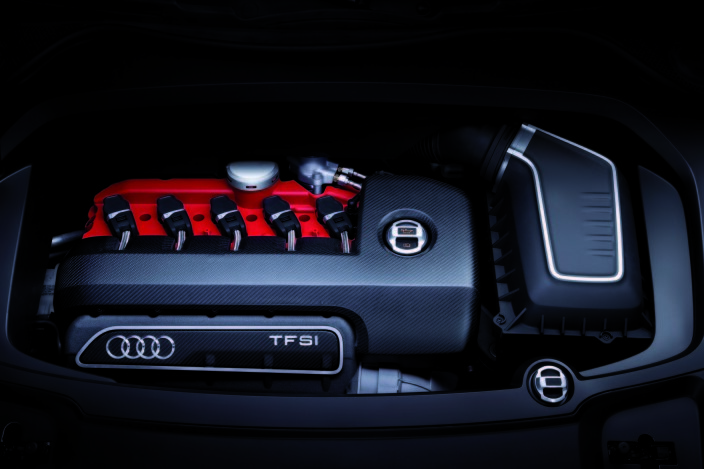 Under the hood of the TT RS will be one extra cylinder, making this engine a 5-cylinder rather than the 4-cylinder in the other variants of the TT. The TT RS features a 2.5-liter 5-cylinder engine which produces an estimated 340 horsepower. This is a completely different engine than the 2.0-liter turbo-charged 4-cylinder, which produces 265 horsepower. The Audi TT RS will become available for purchase in late summer 2011. However, if you wish to get your hands on this petit German beauty you better act quickly. Under 1000 units will be produced for the U.S. market. The vehicle is expected to be priced around low-$60,000 range.